I received one of my most interesting birthday cake requests this week, and could not have been more excited about it! After discovering Magnolia Bakery (and it’s PHENOMENAL banana pudding) last year, this dessert has earned a special place in my heart. 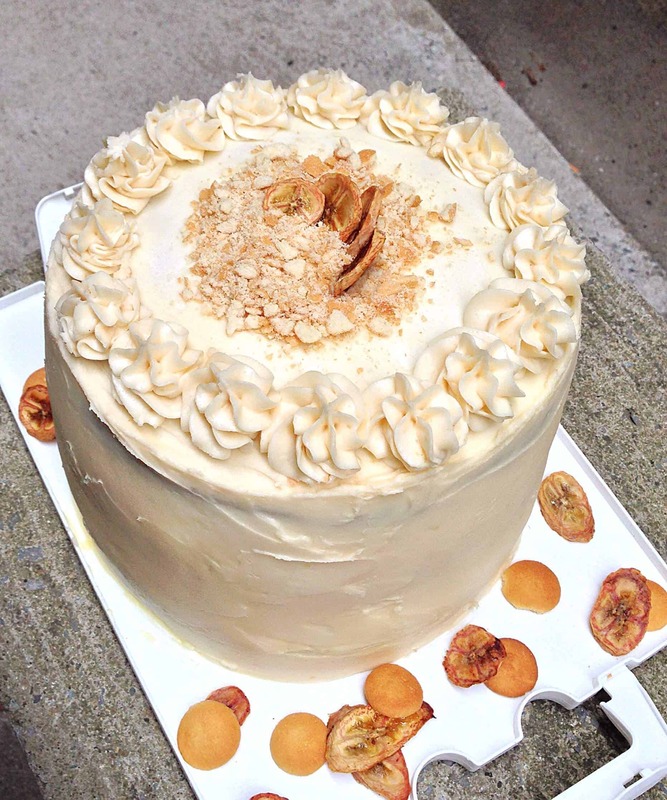 I decided to combine three things I’ve made in the past to create this colossal cake: my Monkey Cake Base, my Magnolia Bakery Copy-cat Banana Pudding, and my banana chips. I decided to make this cake a day in advance, so the Nilla wafers could absorb the pudding filling, just like traditional banana pudding recipes call for. I also reduced the amount of water used to make the pudding, to thicken it and help stabilize the cake. Begin with the banana cake base. Preheat oven to 275°. Butter, flour, and place parchment paper circles in four nine-inch, circular cake pans (I made three layers, but wished I had done four! The tops get too rounded if you try to fit all the batter in three pans). In a small bowl, mix the mashed banana with the lemon juice, and set aside. In a medium bowl, mix the flour, baking soda and salt, then add eggs, one at a time. In a large bowl, cream butter and sugar, until light and fluffy. Add the vanilla, then beat banana mixture into the flour mixture, alternating with the buttermilk. Pour the batter into the prepared pans, and bake for about 45 minutes, or until a toothpick inserted in center comes out clean. While the cake bakes, begin to make the pudding filling. In a medium bowl whisk together the sweetened condensed milk, and ice cold water, until blended. Add pudding mix continue to whisk into fully incorporated. Cover with plastic wrap and chill until set, about 2 hours. Once pudding has set, fold in the cool whip. Refrigerate until cake assembly. While the pudding sets and the cakes cool, prepare the vanilla buttercream frosting. Beat the butter until it is light and fluffy. Mix in the salt, then add the powdered sugar in three installments. Mix in the vanilla, then add cream as necessary, until desired consistency is reached. Once all the components of the cake are cooled/set, assemble the cake. 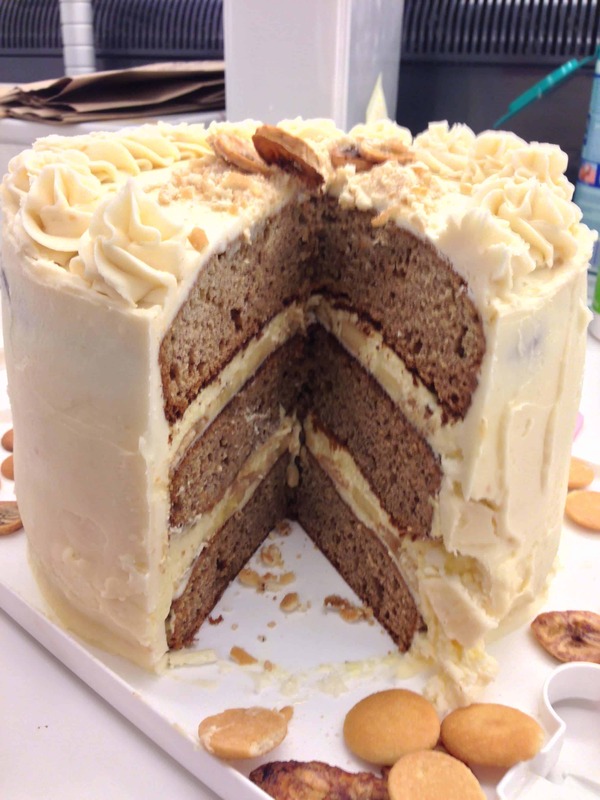 Layer each cake round with a spread of frosting, nilla wafers, bananas, and 1/3 of the pudding. Repeat with remaining layers, then apply a thin crumb coat the exterior of the cake. Let this chill in the fridge for 30 minutes, to allow the filling to stabilize, and to let the crumb coat harden. 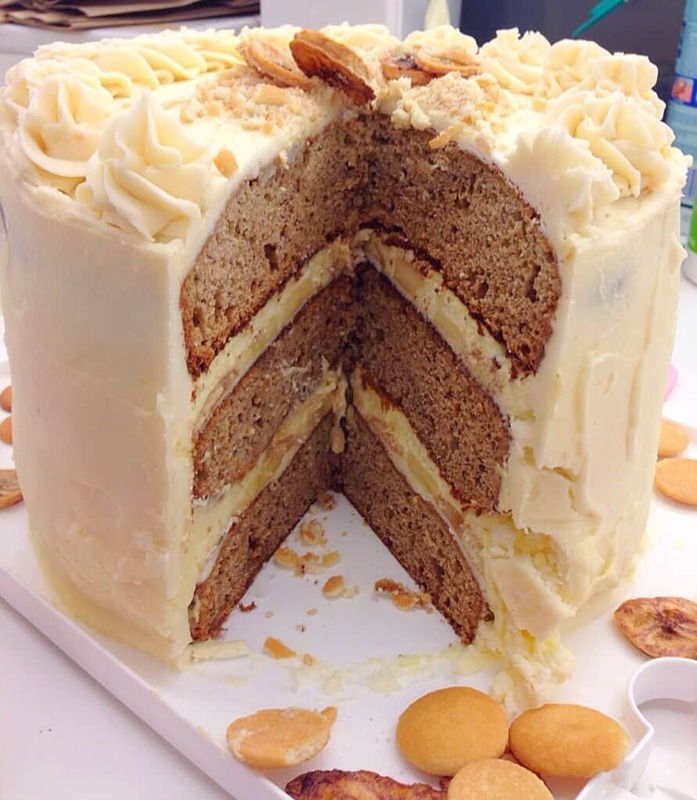 Apply a thick layer of frosting to the exterior of the cake, and top with buttercream swirls, and a garnish of crushed vanilla wafers, and banana chips. This is one of the largest, heaviest cakes I’ve made thus far. It is a very moist, dense cake, but not overly rich. 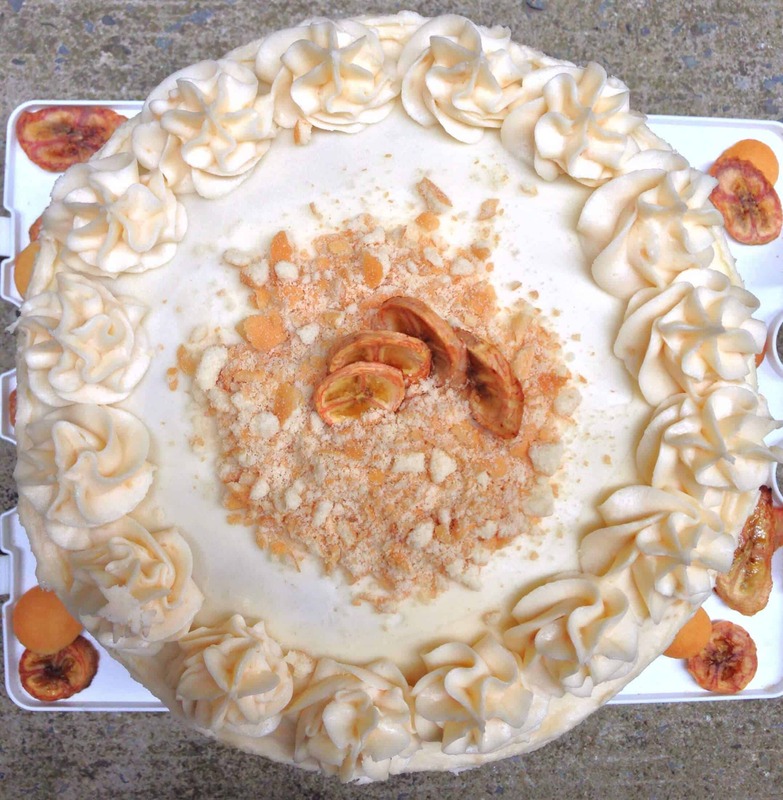 The monkey cake is a perfect base for the banana pudding filling, and the concept is so playful. I LOVED THIS CAKE! Let’s hope Josh and Oliver felt the same way about it. Happy Birthday guys!! I am also a huge banana pudding fan! I want a big piece of it right now! Lovely cake and pictures chelsweets! ? This looks delicious! I love a layer cake of any kind, because of extra frosting, but this looks super moist and yummy! My monitor does not taste nearly as good as the pictures you posted suggested it would. Hi planning on making this cake tomorrow but I’m confused about the baking temperature is it correct at 275 Fahrenheit I’ve never seen a cake recipe at such a low temperature just wondering ? Yes its the real temperature! The low heat helps make it super moist!! However, you can bake it at 350, and reduce the bake time!! For the pudding, your recipe says 3 cups cool whip, but in the directions, you say to beat heavy cream until stiff peaks. Which one is it, and would I use the same amount if it is heavy cream? I was testing out which I liked better, and it actually was more stable with the cool whip! I’d recommend going with that! !